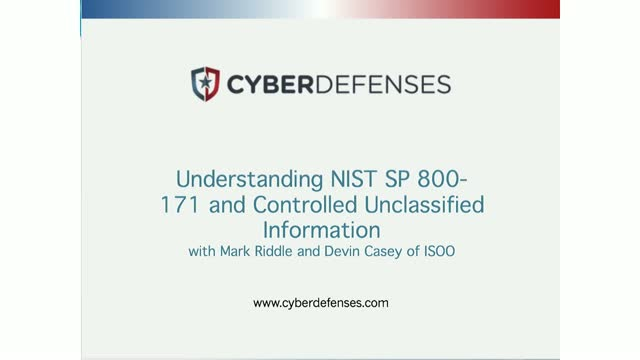 Join CyberDefenses and NIST SP 800-171 co-author Mark Riddle for a short introduction to CUI(Controlled Unclassified Information) and the NIST 800-171 requirements. Mark will be joined by his colleague at the Information Security Oversight Office (ISOO), Devin Casey to provide an overview and respond to your questions. The call will be hosted by CyberDefenses CTO, Damon Fleury. If you are a federal contractor, then you have recently been talking about NIST 800-171. This publication outlines a series of 110 security controls that every federal contractor will have to address, given recent DFARS and FAR regulations that set deadlines for compliance in 2017 and 2018. Runbeck Elections Services, the leader in elections services, is excited to partner with CyberDefenses, a premier cybersecurity services provider to introduce the first comprehensive cybersecurity audit built specifically for elections departments. In this webinar, we'll share what the new relationship means for you and the benefits you can expect including assessments and ongoing cybersecurity support and training. Now the cyber threat stakes are just as high for businesses as they have been for the military for decades. Join this webinar to see how your cybersecurity efforts measure against military cyberescurity practices that have proven effective in the most contentious cyber threat scenarios. CyberDefenses was founded by military cybersecurity veterans in 2001 and since then, we've worked to protect military installations around the world. Now, in response to the escalating threats facing businesses, we're making this same level of advanced security available to non-military organizations. In this webinar, we'll share some of some of the military best practices that we use to protect our clients. You'll be able to see how your program compares and benefit from our lessons learned to strengthen your cybersecurity efforts. Is it possible to efficiently sift through the mountains of security alert data collected daily to hone in on what indicates a real incident? And even more importantly, is it possible to accomplish this quickly enough to be able to immediately mitigate the potential damage? The Department of Defense compliance deadline was the last day of 2017; now that 2018 is here, what does that really mean for DFARS and FAR contractors? DoD revised their message in testimony to the Senate Armed Services Committee by throwing a lifeline to vendors and contractors. Join us for a discussion on what that lifeline is and how to move forward in the new federal contract reality. Learn how the EU General Data Protection Regulations affect US based companies. Join CyberDefenses and Privacy Ref's Bob Siegel to review how the GDPR directly impacts US based corporations. These far-reaching regulations impact any company that stores or transmits identifying information of any individual within the EU. In this webinar, you will be introduced to the basic elements of the GDPR and you will discuss the requirements that require action for US focused companies. President and founder of Privacy Ref, Inc., Bob Siegel, started the company in 2012. After his time as Senior Manager of Worldwide Privacy and Compliance at Staples, Inc., Bob applied his experience and expertise to assisting companies implement and maintain strong privacy programs. Bob has worked with many different organizations, dealing with programs of all sizes and regulatory needs. Always seeking to improve his own understanding of all things privacy, Bob has earned certifications from the International Association of Privacy Professionals. These include certifications in US private and public sector, European, and Canadian privacy laws. Bob has also earned certifications in Information Technology Privacy and Privacy Program Management. Bob Siegel has also been recognized as a Fellow of Information Privacy by the IAPP for his outstanding dedication to the privacy community. He has also served on the IAPP's Certification Advisory Board for the CIPM program and the IAPP's Publication Advisory Board. Bob also serves on the IAPP’s teaching faculty leading classes in the areas in which he is certified. CyberDefenses is a premiere cyber security services organization, providing advanced security services to the commercial and federal sectors. CyberDefenses Academy provides advanced training the IT, security and privacy professionals that wish to be at the top of their field. Do you have federal contracts? If you do, then NIST 800-171 has probably started to get your attention. The DoD has required that all of its vendors attest to their compliance with this standard by the end of 2017. All other federal agencies will follow suit within the next 3-5 years. What is involved in assessing whether you meet this standard? What does it mean to declare your compliance level and how do you accomplish this? In this 30m webinar, CyberDefenses' CTO Damon Fleury will outline what you can expect from the 800-171 process, based on our experiences from our own assessments and those of our clients. This webinar will be informative to anyone performing their own assessment, as well as to those still trying to figure out where to start with 800-171 process.